What is the Major Taylor Project? The mission of Major Taylor Project is to reach underserved youth in diverse communities of Seattle. And not just reaching them, but creating access and opportunity and knowledge for these students. In cities like Atlanta, LA, or DC, race does not necessarily denote income. But in Seattle it’s very startling how it does. A lot of the diverse communities here are the low-income communities. When you look at the schools in these communities, there are upwards of 75-to-95 percent free and reduced lunch rates. Six years ago at Cascade we looked at the demographics of our membership, our volunteers, what communities we were serving with our bike advocacy. We discovered we weren’t serving all communities. Our membership and volunteer pool was not very diverse at all—whether age, race, gender. We looked at where we could affect change right away and decided to start at the high school level where there were existing touchstones in the community. We said let’s work with youth. Let’s use free and reduced lunch figures to determine where we can best affect change. We started with two schools. Our curriculum was riding one day per week for two to three hours from March to the end of the school year. Over the past six years we’ve built out the curriculum. At one particular high school the Major Taylor Project is so popular students ride twice a week. Mondays they’re at capacity and there were enough students to create a second day of riding. There are over 40 students enrolled in that one program. When we started, the idea of doing the (annual, 200-mile) Seattle to Portland (STP) ride was just a whim that we threw in front of the students. The first year, we had nine students who were interested, but were also like “why would you want to ride your bike to Portland?” We told them it’s a cool experience, you challenge yourself physically and mentally, and you end up in Portland. Some of them had never been past SeaTac. We put together a plan, just like a racing training plan. We’re going to go five miles. Then we’re going to go 10, then 15, then 40. Ed racing in Seattle. Photo by David Longdon. How has the curriculum evolved over the years? The after school rides was the original program. Then in year three we started Earn-a-Bike. It was a six-week program delivered during the winter. We wanted to build out Major Taylor to make it a year-round effort. Students learn how to work on bikes for six weeks, build their mechanic skills, then get a chance to earn the bike. We give them a helmet and a lock and a set of lights. The third phase grew from a debrief with the students. We asked them what they wanted to do next, what they like about bike club—they call the Major Taylor Project “bike club” on campus. They asked, “can we use the bikes to raise money?” I said tell me about that. Well what would you need money for? I asked them if they knew why that is and they said no. Thank goodness one of our ride leaders does a lot of work with youth transformation and empowerment around race and equity. He broke down the redlining of the 40s, 50s, and 60s, and the geographic differences. And he explored that out, asking the students what else they notice when they ride to Ballard or Redmond or Alki Beach. The students pointed out those communities have grocery stores, bike lanes, nice roads, libraries, Starbucks. Everyone has nice bikes. After that, this ride leader suggested we create a retreat to debrief and unpack that stuff with the students. It’s our responsibility, if we are going to go to these communities, to educate the students along the way. It really took me back to my personal experience with bikes and helped me understand what my parents were doing for me. My family grew up in a predominantly black neighborhood in Minneapolis. My parents sacrificed dearly to send my brother and I to private school. Dad was an avid golfer and rode his bike to work everyday. Brother took to golf, I took to bike racing. It was a strategy. It had you understand social constructs of race and diversity, digest it, and had you thrive in spite of it. That’s exactly what we need to do with these students. Now we do the Youth Leadership Retreat every year. We pull five or six students from each club so we have 20 to 25 students for the weekend. We talk about leadership, personal power, race, diversity, food justice, equity, social justice. We always relate it back to the bike and how the bike effect each of those areas. They slowly start to unpack this stuff themselves. It led to the fourth phase of the project, having these conversations as a daily part of bike club. And now we’re in the middle of evaluation. Are we being effective at what we’re doing? Are we reaching the intended outcomes? What are the unintended outcomes? A very easy measure of success is: in March the students ride three miles and in July they ride 200. It’s very concrete and it works. But because we’re a bike club, not a research institute, we didn’t know how we’re affecting these students socially and emotionally. Is there any correlation in the classroom? We can ask the teachers for anecdotes like “Frank is turning in his homework now,” but do we attribute that to bike club? Do the smart kids choose bike club or does bike club make kids smart? Through cycling, I knew research scientists at Group Health and Children’s Hospital. I talked to them on a training ride and they said “yeah, I’d love to help you with that.” We’re going to drill down and study the impact this program is having not only on the students, but on the school, the productivity, their health. 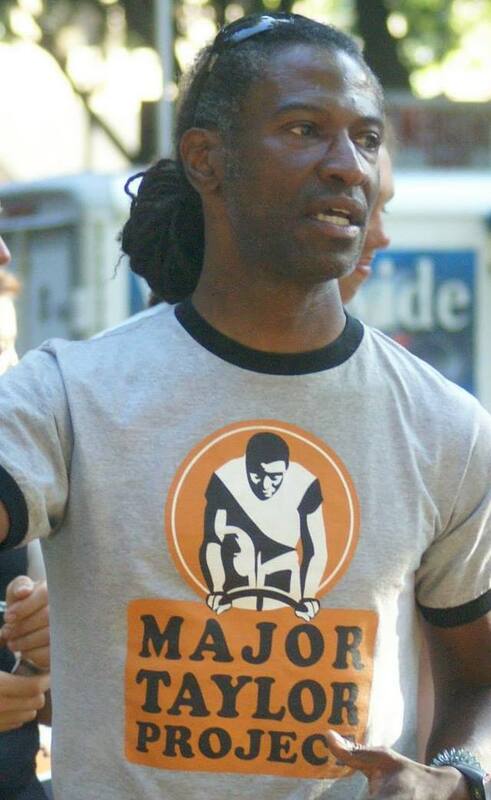 How did the Major Taylor Project get started? Major Taylor got started in 2009 with me, Cascade’s former ED Chuck Ayers, former King County Executive Ron Sims, Dr. Rayburn Lewis, and Dr. John Vassall. I had bumped into Ron on a bike ride. I’d bumped into Rayburn Lewis and John Vassall on a bike before STP. Chuck knew who I was because I used to work for Cycle University–the Diversity and Inclusion and Education department we’re in right now used to be Cycle U’s office. It was all cycling related. 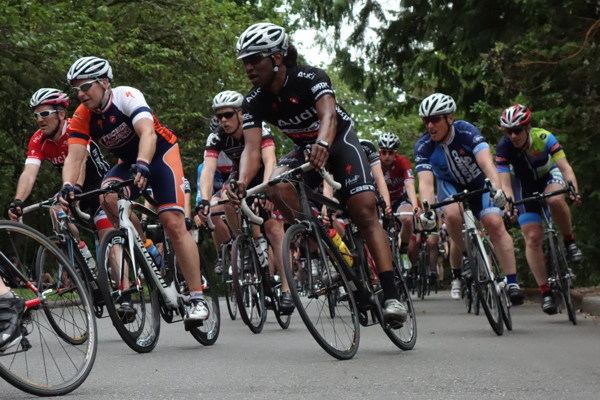 To see other African American cyclists in general, but especially in Seattle—I think Seattle is the third or fifth whitest city in the United States—there was even more commonality and camaraderie between us. The project just skipped 10 steps. The purpose and the vision were clear. We all knew how bikes impacted our lives. We all knew that there are students out there who need access and opportunity. We all knew that it’s about more than just getting kids on bikes; it’s about bringing resources and attention to not only the students, but their communities too. We started going out into the community and talking to folks about it. I met Tim Rutledge at Seattle Bike Supply. I started calling other cycling friends like Robert Trombley and Randy Salamon. Russell Stevenson who’d been doing the mountain bike league. Dan Harm is a Cat 1 racer and he jumped on board. People I’d known for years through racing. They all said just let us know when you’re ready for us to help. It was really cool. You race with somebody every week, then something like this enters the scene and their attention just shifts. People said it’s about time that this issue was addressed. There is such a lack of diversity in cycling or in any sport that has an economic entry. Cycling, golf, tennis, swimming, you name it; if there’s an initial investment you’re going to have low numbers in diversity. Then you start to peel back the layers of why that is. It’s the bigger conversation and it’s what we’re starting to do here at Cascade. The effort went from existing in the small Major Taylor program to existing throughout the whole organization. Now diversity and inclusion is one of our five values in our strategic vision. 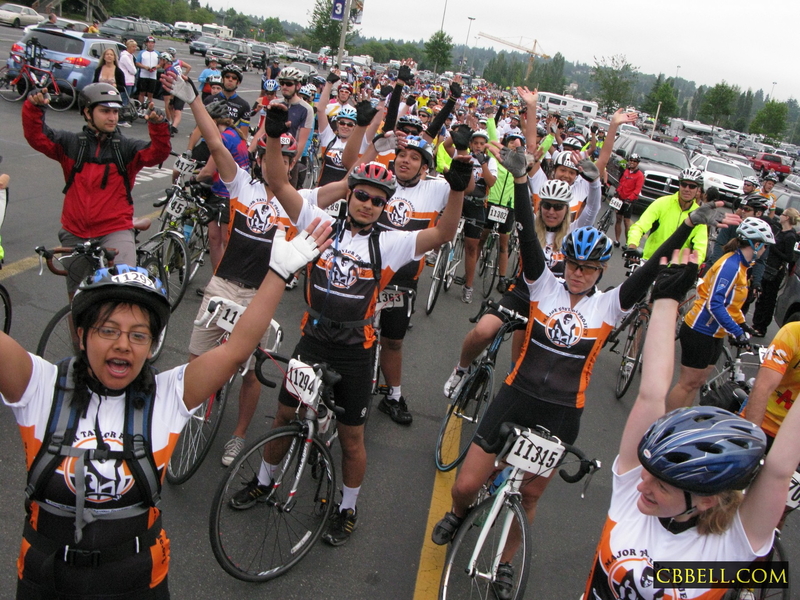 Major Taylor students at the start of the 2012 Seattle to Portland ride. Photo by C.B. Bell. Tell me about your background in riding and racing. There are seven lakes in Minneapolis and they’re all connected by trails. When I was little, my family would take off on a weekend afternoon and just ride. Our parents had baskets on their bikes. Mom would pack a lunch. And we’d go off for the afternoon. I had the opportunity to talk to my parents about why they like to bike. Being African American and living in an African American community in the early 50s and 60s in Minneapolis, MN, riding a bike just wasn’t something people did. But it was something my mom and dad loved to do. It was good exercise, a good way to see the community, and it was just fun. My dad rode to work everyday when there wasn’t snow on the ground. I started riding with him. When I was old enough, they bought me my own 10 speed. I would ride and noticed there were guys out there with these cool wool shorts and wool jerseys on these cool bikes riding really fast and I was keeping up with them. Then I saw a five-minute episode of the Wide World of Sports that showed this guy Greg LeMond in a race that lasted three weeks in France. I was like oh my god, what is that? I didn’t know it was possible to ride for three weeks. As soon as I saw that I was hooked. Everything about it—the shoes, the socks, the jerseys, the bikes, the way they looked on the bikes—that’s what I really wanted to do. I entered my first bike race and just loved it. After that I wanted to join a team. The two big teams in Minneapolis were Kenwood Cyclery and Flanders Brothers. I had to get a racing bike and my dad said, “Ed if you want to race and you’re serious about this, I’ll help you buy it.” The day he saw that drive in me, we were watching the ‘84 Olympics and Nelson Vails was winning the silver. The day after we got my racing bike I went to Kenwood Cyclery for their Saturday morning training ride. I rolled up and it was just these really fit guys. All tan, all on brand new Bianchis, with their cycling caps perched on their head that certain way people did back then. These guys were cool. I just said, “hey I’m Ed, is there a training ride?” Out of 10 guys, maybe two talked to me. There was an older guy, about 6’4″. You could see every vein on his leg. He had an awesome handlebar mustache. You could tell this guy was legit. Every training ride he would give me a new tip. Here’s how you want to ride over railroad tracks. Here’s what’s coming up with these city limit sprints. Watch and learn from the pack. That first training ride was 85 miles and I didn’t bring any food. But I didn’t tell anyone I was bonking. I got back to my parents place and they were on the back deck. I rolled in and just fell over. I woke up and my mom was standing over me and was like “you alright, babe? I’ll get you some water.” My parents just saw that determination in me and fully supported it. I can’t remember a bike race my dad wasn’t at. I raced all through college in Wisconsin and back in Minneapolis. I moved out to Seattle in 1988 for a job. I put bike racing away for a couple years, but came back. I joined a team out here and got heavily involved. In the mid-90s I met Terry Buchanan and George Gibbs at the old shop on Lake Washington, Il Vecchio. They started the team that became Broadmark. Broadmark split and became Hagens and Carter. Then Carter morphed into Lenovo, which morphed into Audi. I’ve got a closet full of Broadmark, Lenovo, and Audi crap. I love the details, the handlebar mustache, the veiny legs. I have such vivid memories. I remember the people who treated me well. And I remember the people who didn’t treat me well. A lot of that was based on race. You show up and you are doing a nontraditional sport, ignoring stereotypes. Some people don’t bat an eye at that. For other people it’s a big challenge for them mentally. Some people will get past it. Some won’t. They don’t like to see it. It makes them uncomfortable. But it’s not my job to make them comfortable. My parents didn’t raise my brother and I that way. And that’s the essence of Major Taylor: to help position these students for success in their life through our passion, bikes. Even today it’s still there. You have a lot of African American bike racers like Rahsaan Bahati, Giddeon Massie, they have the same stories. I remember the first time I went and did the Boise Twilight Crit. A lot of people were like “hey man, can you tell me about your story?” And there were others yelling every racial epithet they could think of. You don’t accept it. But you understand it, anticipate it, navigate through it, and be successful in spite of it. You talked about one of the barriers for kids in the disadvantaged communities you’re working in being the upfront financial cost. Are there other barriers to cycling? That’s a great question. Economic barriers to entry, racial barriers to entry, simply access is a barrier. Seattle’s a very segregated city. South Park, White Center, Central District, Rainier Valley, Renton, Tukwila, Federal Way. There are these pockets of poverty. What makes Seattle so interesting is you have all this industry—the Boeings, the Starbucks, the Amazons, the Microsofts—all this supposed access, but the access doesn’t reach all. There are cultural barriers. For a lot of these students, cycling isn’t on the radar. Soccer and basketball are on their radar. But in some schools you have “pay to play.” You have to pay for uniforms, bus fees, all that. Not all families can afford that. If the students can’t afford lunch, chances are they can’t afford the uniforms. If they can’t afford those, the after school physical activity opportunities are pretty small. Then you factor in the reduced PE requirement in schools right now, there’s not a lot of outlet for these students. It’s hanging out, playing video games, maybe going to the YMCA or a community center, but there’s not much. Just by geography, just by access in the community, their opportunities are limited. We really didn’t know how severe that was until we showed up with bikes, started taking the students out of their area by three miles, five miles,10 miles. Students would comment, “Where are we? I didn’t know this park was here.” And we were just a few miles from their school. They live a few blocks from school. Their world is school, home, school, home. If there are two parents, they’re working one, two, or three jobs. In a lot of cases, the students are not living with the parents. They’re with an extended relative. We’ve had some students living with their siblings. A lot of students are homeless. I remember the first time I went to Global Connections high school in SeaTac. A friend of mine is the principal. I asked him, given all this, what keeps these kids in school? He explained that in most cases, school is the most stable thing in their life. They get lunch there. We’ve got a great relationship with Clif Bar and some other food product producers. We asked our sponsorship department if we could take some of the extra stuff from Chilly Hilly and STP and give them to the students on these rides. We noticed the students were pretty hungry on the rides and after a long ride you need to fuel up. They said sure take what you need. We came back the following week and said we need more. Then the following week, we need more. They were like what is going on? We explained that in many cases these students didn’t get breakfast. Lunch is the only warm meal of the day. By the time we see them they’re starved, then they’re going to go home and not eat. You hear this on TV or whatever, but this is true. Some of these kids are showing up at Chilly Hilly or Flying Wheels and they have not eaten for a day. This is real. And it’s not a one-off thing. It’s widespread. We were able to take those stories to our sponsors and explain what was going on. We were in a position to really partner with and educate the sponsors. It helped bring a social consciousness to their support of us. You’ve talked about how the Major Taylor Project inspired Cascade to adopt diversity and inclusion goals into everything it does. It seems like bike advocates elsewhere are also slowly starting to understand that diversity and inclusion is an important piece of advocacy. What needs to happen to keep that momentum, to make diversity and inclusion a given in bike advocacy instead of a one-off goal? A lot of the awareness now and the visibility comes from our new ED Elizabeth Kiker. She comes from the League of American Bicyclists. She was very instrumental in creating their Women Bike program. She came here and asked, “where’s our organizational effort? We’re the biggest bike club in the country. This should be our focus.” She accelerated that by 1000 percent. The question you just asked is what we have asked ourselves, and what we’re planning for now. In our infusing diversity and inclusion into our work, we have to make it part of the filter we check ourselves against. We have to ask what are the areas we’ve traditional focused on? What are the areas we should be focused on? What are some specific events we could do in diverse communities? What are some specific things we can do for outreach to diversify our membership? It could be in our website, in our organizational literature. We’re having these conversations and doing something about it. It’s now part of our work plans. It’s an active strategy for us as an organization. It’s new and refreshing. I know we’ll be successful. We’ve had some really frank and honest conversations about the fact that this is hard work. And yeah it is. But it’s the right work and our responsibility to do it. I think a lot of people probably don’t think about this, so simply put, why is diversity and inclusion important in cycling and bike advocacy? It’s a great question. Diverse communities have ridden bikes for years. I can personally vouch for that. It’s our work to make sure our advocacy and organizational efforts are equal for all communities and all people. It’s not just an issue of diversity; it’s an equity issue too. In the spirit of continuous improvement, it’s our responsibility to look at the work we’re doing in the community and constantly ask if we can do better, if we can do more. What are our blind spots? Does our diversity of membership reflect our interests? Serving diverse communities helps us learn and be better as an organization. I firmly believe that a collective voice is a powerful voice. A diversity of opinions and ideas is better for everyone; it’s a better way of doing things. Another reason it’s important is the health and wellness aspect. Not everyone wants to run or swim or play golf. But most people can identify with the day they discovered balance on a bicycle. It is part of our responsibility to share the joy of cycling. It’s also good business. We’d be naive not to say so. There’s new membership there. And at the end of the day, it’s the right thing to do. What’s the best part of running the Major Taylor Project? Oh man. I think it’s the relationships you develop with the students. It’s the richness of their backgrounds. It’s the opportunity to learn. I love that the project attracts young, bright, creative people that are thinking and concerned and excited and passionate about equity and diversity and social justice. I just think, “wow.” I see this younger generation who thinks we should be talking about this stuff, asking these tough questions. They come to this program and they just say, “yup. How can we help change this thing?” It’s the freshness of the ideas, the attitude, the spirit and the energy. It’s infectious. I love finding opportunities to partner with more communities. And to really understand what’s going on in the community; to figure out how our passion for bikes helps affect that need? How can we use bikes to help these kids get into college? That stuff is just exciting. At the end of the day, when people ask me, “how’s work?” I say my stress is about getting more people on bikes. I feel very blessed to have the job that I do. I love to be able to share my passion and possibility with not only the students, but the adults we come in contact with too. And of course, to see the students ride three miles, then finish STP, that’s a whole ‘nother level of awesome. 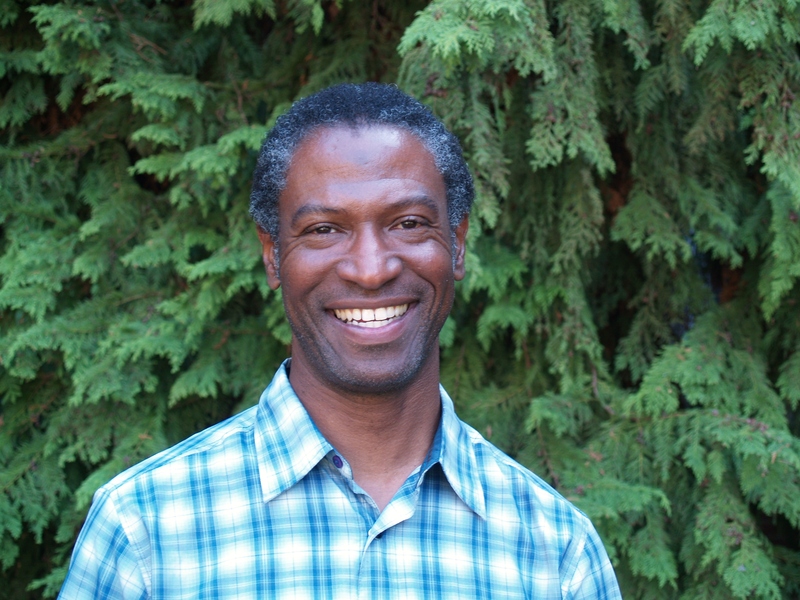 This entry was posted in Advocacy, Interviews, Racing and tagged cascade bike club, diversity, ed ewing, equity, major taylor project, nelson vails, poverty, race and cycling, seattle, youth empowerment. Bookmark the permalink. Simply an awesome and exemplary human being! Awesome work Ed. Keep it up. Ed, giving you the highest of “high 5s,” and an emphatic fist-pump. You inspire me to keep looking for activities – be they in sport or otherwise – to increase participation in youth (and adults) from diverse communities. There are so many awesome experiences to be had out in the world, and everyone should have real access to these opportunities. As always an inspiring moment with Ed and his dedication and focus on diversity. Keep riding and challenging us all on including others in all aspects of our lives. You are an inspiring individual and help us all to live better together and grow stronger as a community!